a same-hour quote for any quantity of barcodes required. 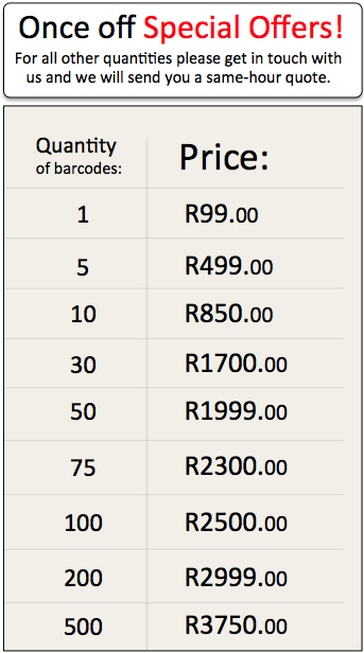 At BuyBarcodes, we make use of PayFast for all online barcode purchases. Using their secure payment portal, customers can make instant payments using credit or debit cards from all South African banks. Payfast is fully-encrypted and is able to accept both Visa and MasterCard. For customers who would prefer to pay by EFT or bank transfer. Please follow the instructions as laid out in the Payfast payment instructions. Please note that you will be required to include a specific code or number in your payment reference so that Payfast is able to link your payment to the correct purchase. If you have any queries relating to EFT-payments please feel free to give us a call and we will happy can guide you through the process.